What is the Sharing The Illumination Wealth Podcast? It’s a weekly show that is designed to help you achieve the greatest return on your entire financial life by addressing wealth building from the inside – out. This is the convergence of personal growth along with financial & emotional intelligence. There are a plethora of podcasts that talk about money, investment strategies and getting out debt. This is what you need to listen to if you want to strategically design your life & wealth for enduring financial independence. 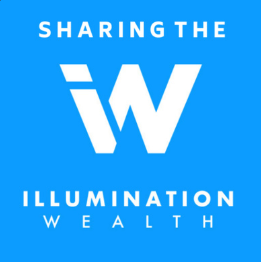 Sharing the Illumination Wealth is available on Apple Podcast (iTunes), Stitcher, Spotify, and all other podcast listening apps. You’ll also be able to read episode summaries and listen to the show on the Illumination Wealth Blog. When Does the Show Launch? We already have 6 Episodes Live for you to listen to! Subscribe on Apple Podcasts, leave a review, and tell the world about the show on Facebook, Linkedin, and Twitter.